We work hard to provide a great student experience for our students. We also want to make sure that there is always a place where you can tell us how to make your time at Sussex even better. That place is the Ingenious Bar, a drop-in session with the Head of School and/or members of the Management Team to speak about your experience as a psychology student at Sussex: what you like, what you don’t like, and any queries you might have about your course. Anything you tell us will be confidential, and we will try our best to take any suggestions on board. Who is the Ingenious Bar for? The Ingenious Bar is for you! Any Psychology student, from undergrad level to PhD, can use the Ingenious Bar. How does it work? What kind of subjects can I discuss at the Ingenious Bar? That depends on you. You might want to tell us how much you like your course (we’d love that! ), or point out certain things that in your opinion could be better. You might have an idea for a School related initiative or event that the we could sponsor. You might have a query about a module, and your convenor or Academic Advisor is not available. You might be going through a difficult situation and want to talk about how this is impacting your studies (we’ll do our best to support you). In the past, we have received queries about marking criteria, project work, and even parking spaces. Whatever the subject, we want to hear it! The staff at the Ingenious Bar will try to answer your queries on the spot or refer you to the relevant person. We will make sure to chase it up and get back to you with an answer as soon as possible. Every term we will publish a report here on the School blog, a kind of ‘you said, we did’. The report will not include student names to ensure that all queries remain confidential. Who will be at the Ingenious Bar? We are also organising special sessions dedicated to specific themes, from assessment to careers in Psychology, and we will invite guest speakers from other sections of the University. Check the calendar on this Canvas site to see who will be at the Ingenious Bar and when. Every Monday to Thursday, between 12:30 and 13:30, at the reception desk in the School Office (Pevensey 1, 2A13). The calendar on the UG Psychology module on Canvasshows the days and times when the Ingenious Bar will be open. Wow, i would like to start by saying that this is a very good blog post! I have been following your insights on psychology and would love to complement your knowledge on the various psychology topics, theories and arguments. Thank you, I’m glad you like it. All our posts are contributions from our staff and students and they intend to showcase the research carried out in the School and the experiences of our students. 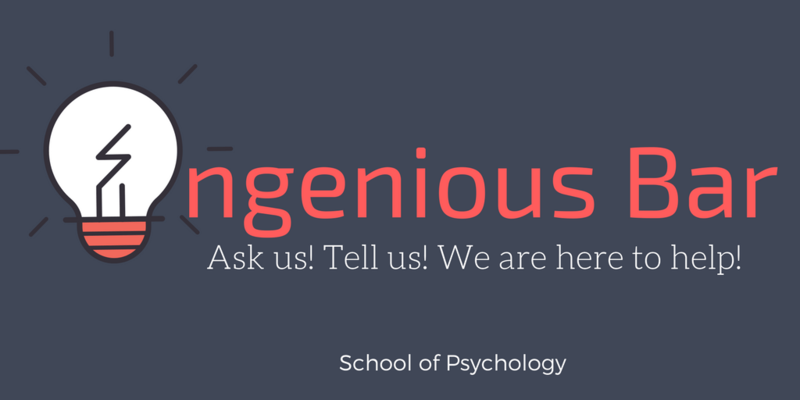 1 Pings/Trackbacks for "Psychology’s Ingenious Bar"